You can't absorb all of Lviv in just one visit, but you can fall in love with it! 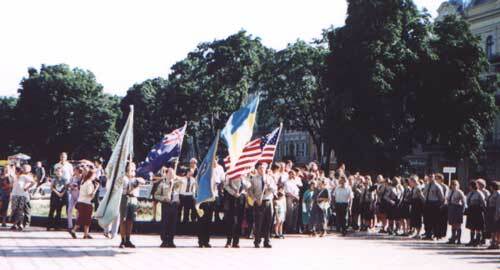 The Sixth World Zlet of the Ukrainian Youth Association commenced on 16 August 2001, in Lviv, Ukraine, at five o'clock, with sumivtsi in uniform parading along the historic streets of the city. 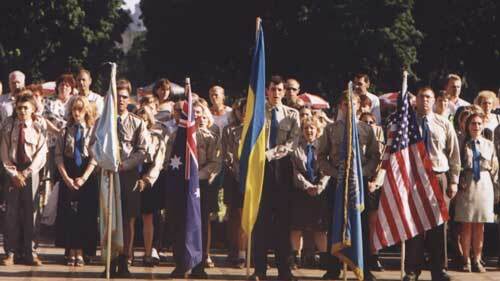 Leading the procession were the flags of the nations in which CYM is represented. 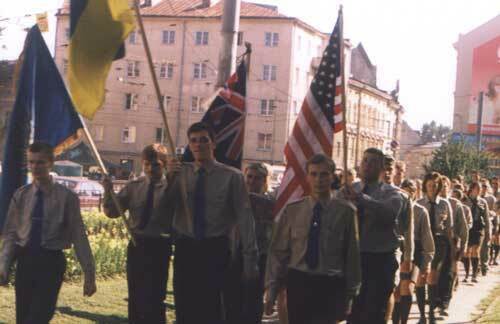 Fluttering highest of all was the blue-and-yellow flag of Ukraine, which united the more than 200 Zlet participants from three continents. Few of us had yet seen so many druzi (friends) and people of like mind together at one time... to feel hundreds of hearts beat in unison. The residents of Lviv, too, felt the oneness of our spirit. Upon seeing us, most simply stood in awe. Suddenly, a voice proclaimed from the crowd: "Slava Ukraini!" (Glory to Ukraine!) to which our voices resonated loudly in response: "Heroyam Slava! (Glory to the Heroes!). 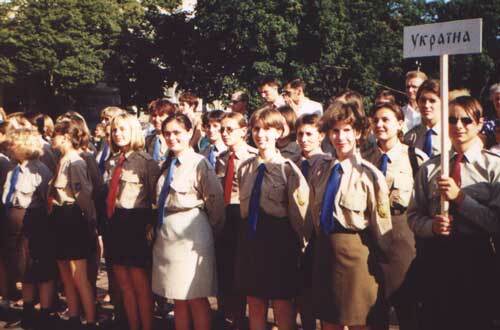 The opening ceremony took place on the square near the Zankovetska Opera House. Welcoming the participants and guests were: Wira Hajdamakha, chair of CYM's World Executive; Vasyl Kujbida, the mayor of Lviv; Yaroslav Kashuba, from the head office of Lviv Oblast Youth, Sports, and Tourism Ministry; and Taras Rondzistyj, representing the Organization of Ukrainian Nationalists. After the opening ceremony, the Zlet participants separated into groups, each led by a local sumivets, to tour the "City of the Lion" and become familiar with its contemporary life as well as its history. We meandered through the ancient city, soaking up the ambiance of its narrow streets, along which Bohdan Khmelnytskyj hurried to his studies, and steeping ourselves in the mysterious atmosphere of the Armenian Quarter, with its church that arose from nearby apartment buildings. Lviv's history is written in its buildings. We toured the heart of Lviv, the rynok (market square), where, on November 1, 1918, Ukrainians proclaimed the birth of the Western-Ukrainian National Republic. Two of our group, Olya and Ivanka from Great Britain, asked a plethora of questions about every memorial plaque, which they approached to read, photograph, and to finally, simply bask in what they saw. You can't absorb all of Lviv in just one visit, but you can fall in love with it! 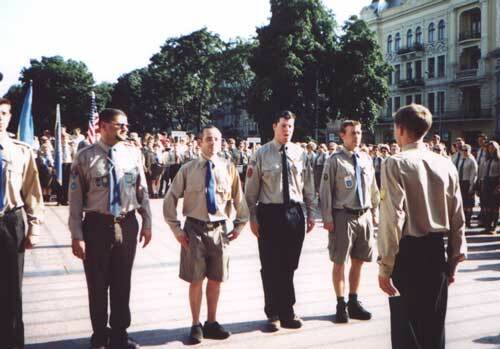 The Canadian contingent (the largest in number at the Zlet) had been troubled, because "their own" Ukrainian Customs had impounded the instruments and uniforms of the outstanding Montreal orchestra Trembita, which had arrived in Ukraine in full force. With fallen spirits and hurt by the incident, some spoke with resentment about the bureaucratic red tape. However, at our evening gathering, we were informed that tomorrow's concert would, in fact, take place. Reassured, the Canadians (and the rest of us) spent the rest of the evening enjoying the children's vocal ensemble Namysto, which enchanted us with their heavenly voices. Their finale told the story of cranes on the wing, reminding us sumivtsi that we, too, flocked together, flying in from around the world to the land of our forefathers. Hence, our CYM travelogue (the need for which was determined from experience with previous World Zlets) is called 'Zhuravel' (The Crane). Later, at the zabava, we danced with great enthusiasm to Lviv's very own band, Mertvyj Piven (Dead Rooster), and sampled some exceptional local beer donated by the Lviv Brewery. And so, in this way, we topped off our infinitely perfect Day 1.